George Williamson Finley was a lieutenant of the 56th Virginia Infantry, who led his company across the Gettysburg wheat field in Pickett's charge and reached the stone wall. Much more information on linked page. JOHNSON’S ISLAND, SANDUSKY, OHIO: 3¢ rose #65 tied cork with Sandusky O cds manuscript examined marking, RICHMOND / Va // FEB / 10 cds and straightline DUE 10, manuscript endorsement of G. W. Finley, 1st Lt Co K 56th Reg Va Infantry on cover to his wife in Clarksville, Va. Nice use both sides on one cover. $900. JOHNSON’S ISLAND, SANDUSKY, OHIO: 3¢ rose #65 tied blue cork with blue Sandusky O Oct, 19 dcds, RICHMOND / Va // FEB / 10 cds and straightline DUE 10, manuscript endorsement of G. W. Finley, 1st Lt Co K 56th Reg Va Infantry on cover to his wife in Clarksville, Va. Small cover erosions at top near stamp. Nice use both sides on one cover. $900. 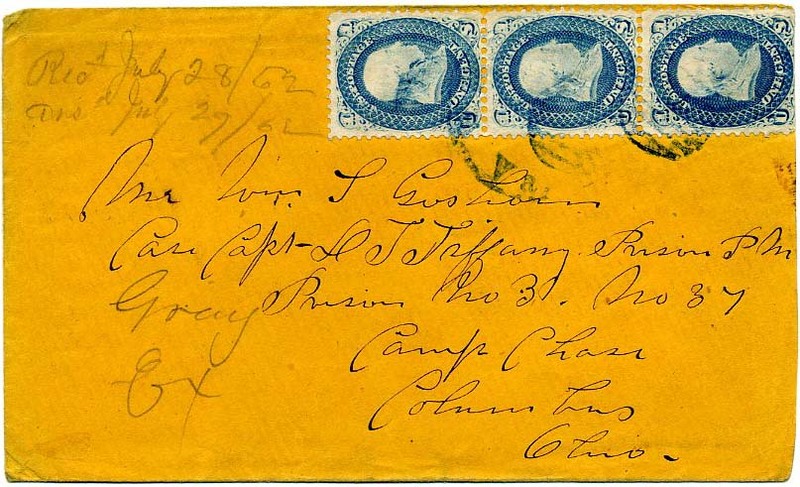 POINT LOOKOUT, MARYLAND (CAMP HOFFMAN): CSA 11, 10¢ blue (small faults) tied RICHMOND / VA // JUL / 19  CDS used together on POW cover franked with US 65, 3¢ rose (small faults) tied target with dcds of POINT LOOKOUT / MD // MAY / 24 / 1864, manuscript “app” examined marking, addressed to Tivia Burnard, Meadows of Dan, Patrick County, Virginia. Stains removed from front of cover but noted on accompanying 2006 CSA Certificate 04883. Nice use of both sides. Ex Kohn. $1,200. CASTLE MORGAN, CAHABA, ALA: Inner prisoner-of-war cover to Joseph Davidson, New Corwin, Ohio with original letter datelined "Cahaba Alibama (sic) February 11th 65", endorsed "Prisoners Letter;" censored on back by Cahaba Commander Capt. Howard Andrew Millett Henderson "Exd. H.A.M. Henderson Capt. & Asst Agt of Exchange, C.S.A. ", "Vicksburg Miss. Mar. 9, 186(5)" double-circle datestamp and DUE 6 handstamp for U.S. unpaid rate, contemporary ink staining on both sides. The U.S. capture of Vicksburg in July 1863 placed U.S. and C.S.A. forces in close proximity; Vicksburg was designated by the U.S. as a principal exchange point in the West, but flag-of-truce mail through that point is surprisingly rare. Approximately 10 covers are known from Castle Morgan, ex Walske, illustrated in Special Routes (p.78). $1,250. CAMP FORD, TYLER, TEXAS: letterhead with the Great Seal of Maine, State of Maine, Head Quarters, Adjutant General's Office, dated Augusta, Sep. 30th, 1864, addressed to Mrs. M. J. Robinson in response to her inquiry about Union prisoners at Camp Ford, Tyler Texas, states "I can give you no information concerning the prisoners that were taken in Texas...as they have not exchanged yet it will be impossible to tell who have died or who have not," signed by John L. Hodson Adjt. General, Very Fine. Good fodder for soldier research. $250. 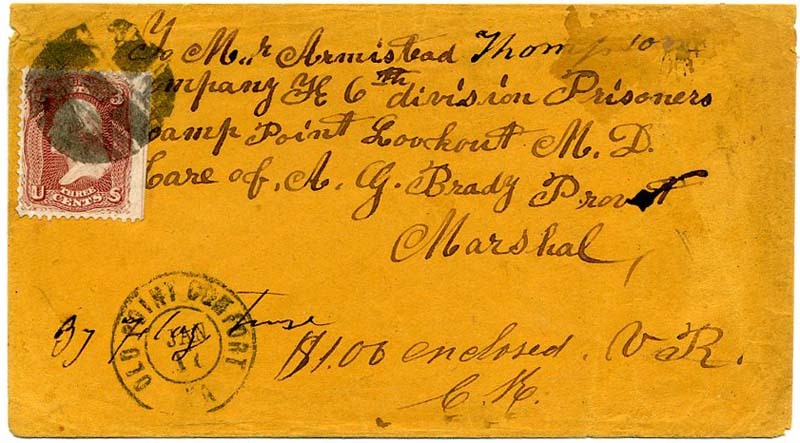 POINT LOOKOUT, MARYLAND (CAMP HOFFMAN): Incoming inner cover addressed to Armistead Thompson, Company H, 6th Division Prisoners Camp Point Lookout, care of A. G. Brady, Provost Marshal. 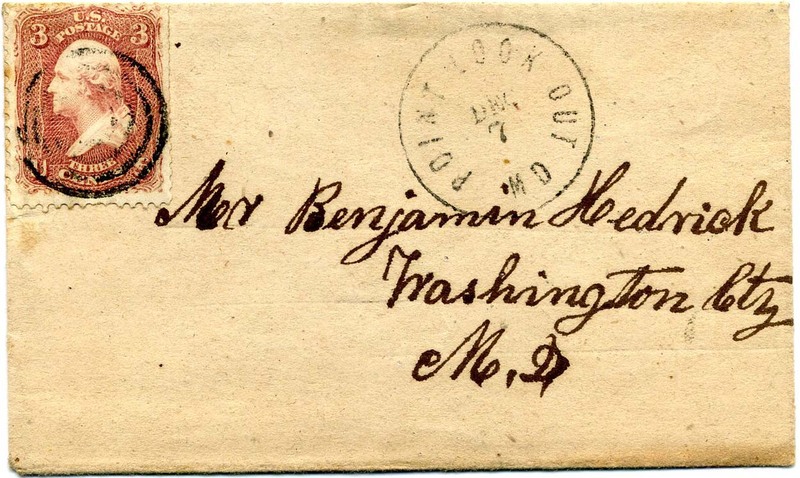 Entered U.S. mails with US 65, 3¢ rose, light corner crease at lower left, tied by cork cancel with OLD POINT COMFORT / VA. // JAN / 17  dcds, censor marking indicating $1.00 enclosed, minor edge nicks, missing back flap. Brady was the provost marshal during the final months of prison operation. The date thus must be 1865 but the prisoner had already died of typhoid a couple months before. Military records included. $300. Armistead Thompson enlisted 22 June 1861 at Dranesville, Virginia, as a Sergeant in Co. G, 8th VA Infantry. Much more information on linked page. 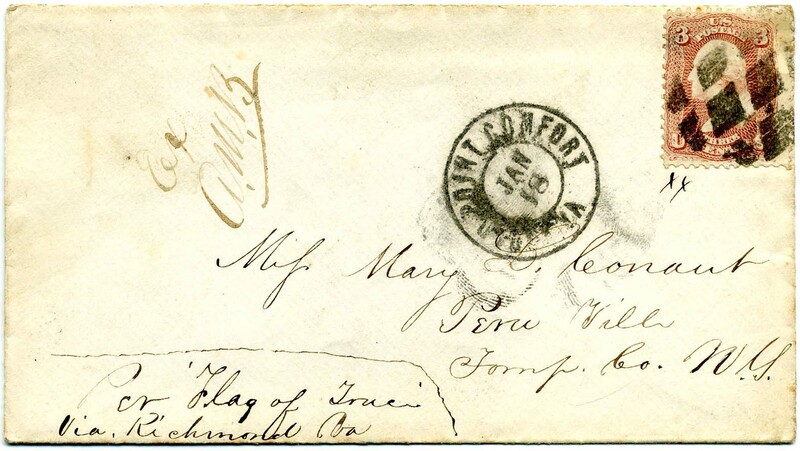 POINT LOOKOUT, MARYLAND (CAMP HOFFMAN): Narrow prisoner-of-war cover to Mrs. Lucy J. Shaver, Salem, Roanoke County, Va; endorsed "By Flag of Truce", "Prisoner's Letter Examined." octagonal censor's handstamp (Type IIa), mixed franking with U.S. postage paid US 65, 3c rose, tied by target cancel with POINT LOOKOUT / MD. // JUN / ? /'64 dcds; Confederate postage paid by pair CSA 7, 5¢ blue tied by RICHMOND / VA. // JUL / 23 cds, edge wear and small mend at top just into Point Lookout datestamp, missing back flap, SCARCE MIXED-FRANKING. Military records included. $1,500. Henry Strickler Shaver (1831-1864) enlisted as a private on 10 February 1864 at Dublin, Virginia in Company D, 5th Virginia Cavalry. Much more information on linked page. CAMP CHASE, COLUMBUS, OHIO: US 65, 3¢ rose tied by “prison bars grid” cancel with COLUMBUS / O. 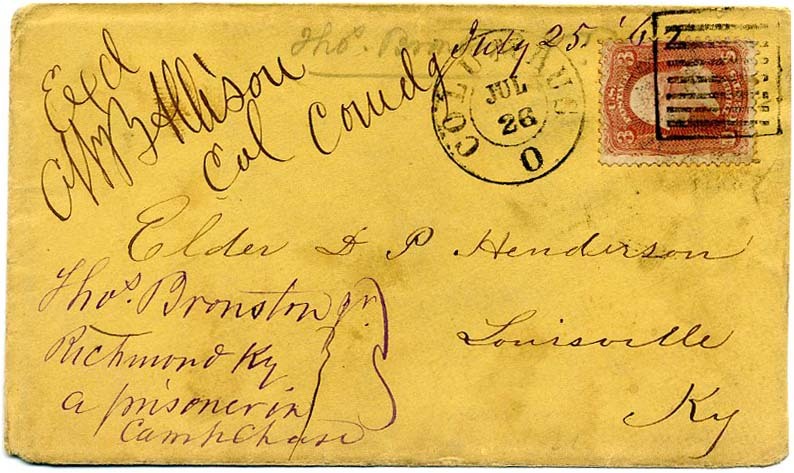 // JUL / 26 dcds on cover addressed to Elder D. P. Henderson, Louisville Ky. with bold manuscript "Exd C.W.B. Allison Col Comdg" censor marking and "July 25 '62" in another hand; cover endorsed "Thos. Bronston Jr., Richmond Ky., a prisoner in Camp Chase", name repeated in pencil at top; some edge wear and light soiling. $400. Thomas Springer Bronston (1827-1890) was a civilian political prisoner and prominent Democrat, held at Camp Chase for allegedly aiding the Confederacy; he served as Assistant Secretary of State for Kentucky and U.S. Collector of Internal Revenue after the war. OLD CAPITOL PRISON, WASHINGTON. DC: US 65, 3¢ rose used at edge of cover which has been slightly reduced into the stamp; perfect strike of "PASSED / MILITARY PRISON / W.P. WOOD SUPT." circular examiner's handstamp on incoming cover addressed to Mr. J.D. Reamer, care of Col. W. P. Wood, Supt. HAGERSTOWN / MD. // MAY / 18  dcds. Per The Alexandria Gazette, 21 April 1865, J. D. Reamer was a prominent merchant in Hagerstown, arrested at Point Lookout upon the CHARGE OF HAVING SOME KNOWLEDGE OF THE CONSPIRACY AGAINST PRESIDENT LINCOLN and his cabinet. Lincoln was assassinated on 14 April 1865. $800. 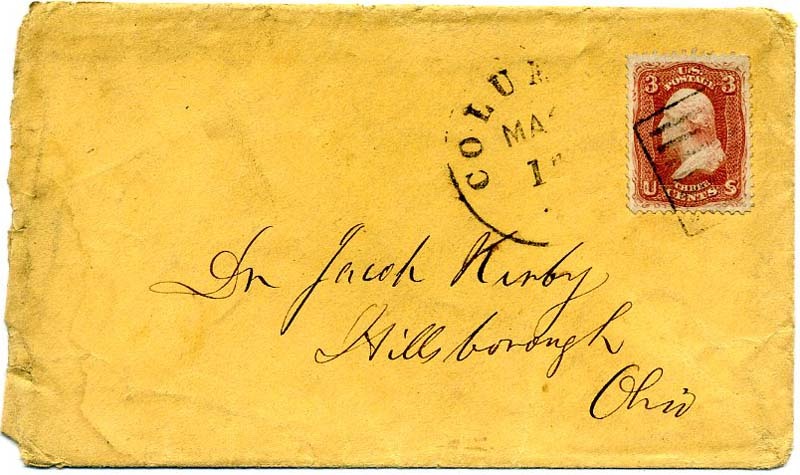 CAMP CHASE, COLUMBUS, OHIO: 3¢ rose #65 tied Columbus “prison bars” cancel with adjoining Mar 17,  CDS on cover to Dr. Jacob Kirby, Hillsborough, Ohio with ORIGINAL LETTER AND FULL TRANSCRIPT. 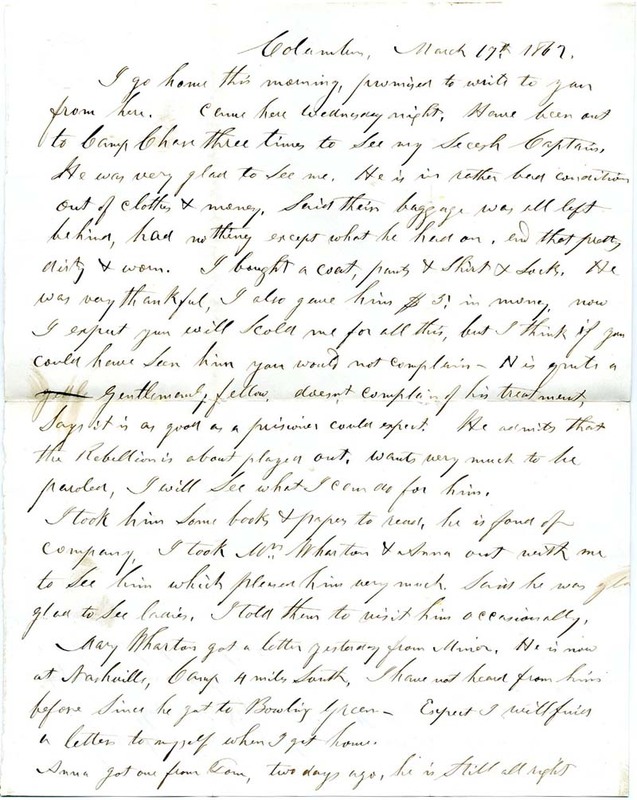 Letter written by Moses Hendrick Kirby to his twin brother, Dr. Jacob Kirby, concerning his visit to his “Secesh Captain” who is a prisoner there. Most likely the captain was among the 14,000 Confederates taken prisoner after the fall of Forts Henry and Donelson and sent north to various prisons. Cover rather war weary but letter in excellent condition. Moses Kirby was a man of National prominence and was intimately associated with Webster, Clay, and Calhoun, and others in his early days. Details in the full biographies included. $250. This letter was written by Moses Hendrick Kirby (1798-1889). Much more information on linked page. 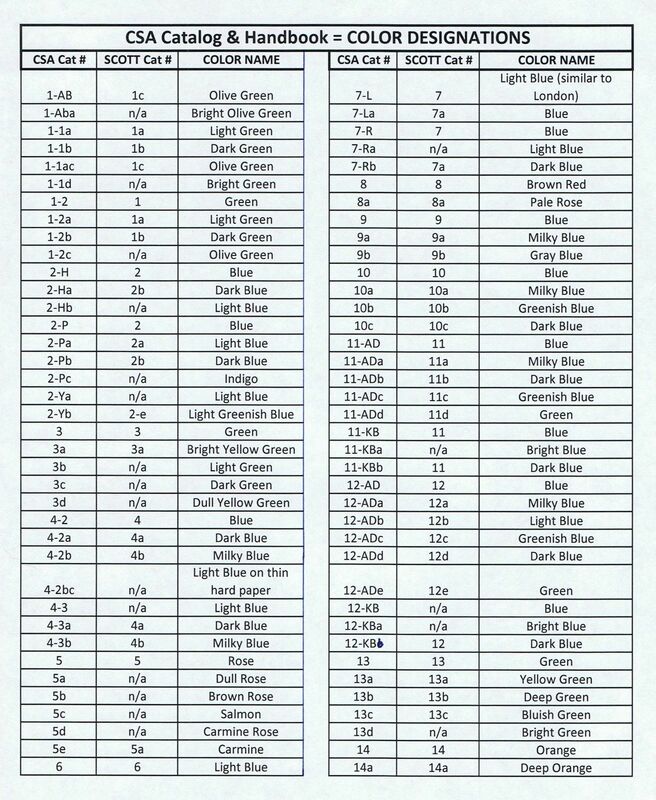 JOHNSON’S ISLAND, SANDUSKY, OHIO: US 65, 3¢ rose tied blue grid with matching blue Sandusky / O. // SEP / 12 dcds and CSA 11-AD with neat strike of Richmond / Va. // Sep / 25, 1863 cds on POW to Mrs. W. J. 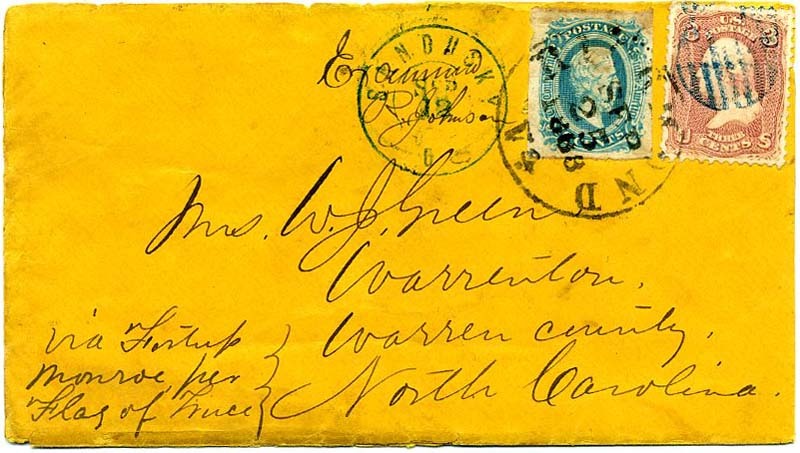 Green, Warrenton, North Carolina “Via Fortress Monroe per Flag of Truce” – wonderful use of both sides postage. Ms. Examined R. Johnson (Corp Rufus Johnson 128th Ohio Vol Inf). Sent by the distinguished Col. Wharton J. Green (1831-1910) who at the time of capture was served as ADC staff officer to CSA General Daniels. He was wounded at Gettysburg in the same attack that killed Daniels and captured when the Confederate army began their retreat. A complete biography included with the cover. And much information online. See Appleton's Cyclopedia of American Biography. Clean cover with minor edge faults and top back flap missing. A beauty! $1,750. POINT LOOKOUT, MARYLAND (CAMP HOFFMAN): CSA 11, 10¢ blue manuscript tied faint “Kitrell NC Nov 10 ”, and US 65, 3¢ rose which is typically uncanceled as “money letters” carrying cash through the lines were generally carried by military courier from the transfer point to the prison in order to avoid looting and did not go through the Union postal system. This is a South to North Money Letter with manuscript notations “$3 U.S. Currency” both in pencil and pen as well as magenta notations “Exchanged 17th Jany (No. 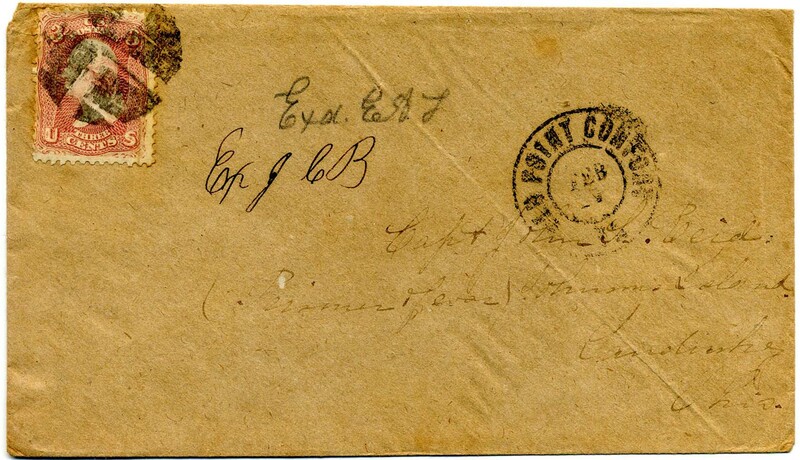 62)”, addressed to [Private] James S. Gill, Prisoner of War, Point Lookout, MD. Pristine cover. $700. Private James S. Gill enlisted 9 August 1864 in Co. D NC 8th Infantry. He was captured at Fort Harrison (Siege of Petersburg) 30 Sept 1864, confined to Point Lookout and paroled at the James River 21 Jan 1865. Likely Private Gill had already been paroled when this cover arrived at the prison. CIVILIAN FLAG-OF-TRUCE: NORFOLK / VA. // DEC / 18 / 1861, blue cds with matching encircled PAID 5C handstamp (CSA type C) on civilian flag-of-truce cover to Miss Harriott Middleton, Charleston, So.Ca Pencil "Exd. 10cts. Pd." (postage due for double weight?) 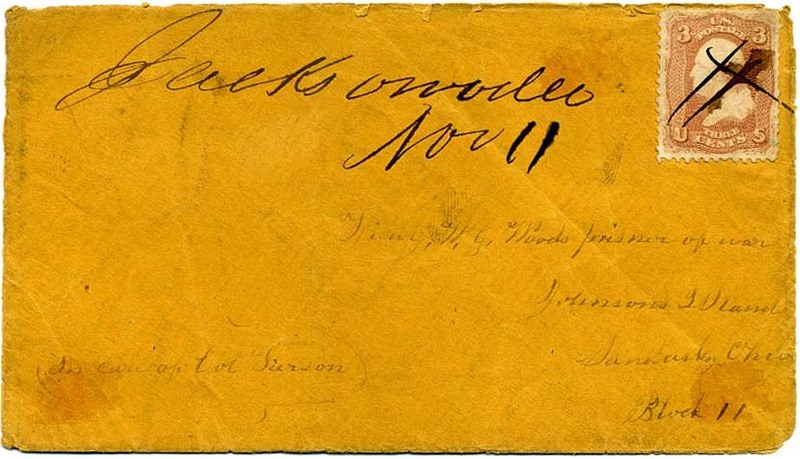 notation, probably enclosed in outer cover containing funds for postage and addressed to Fortress Monroe, typical of flag-of-truce mail it was exchanged at Norfolk, Extremely Fine with undated photocopy of early CSA authentication certificate signed Shenfield as Chairman (1945-48). Ex J.V. Nielsen. CSA Catalog type CIV01 (CV $750). The Middleton correspondence is well-known and this was likely from Harriott’s sister Anne M. Hunter of New York. 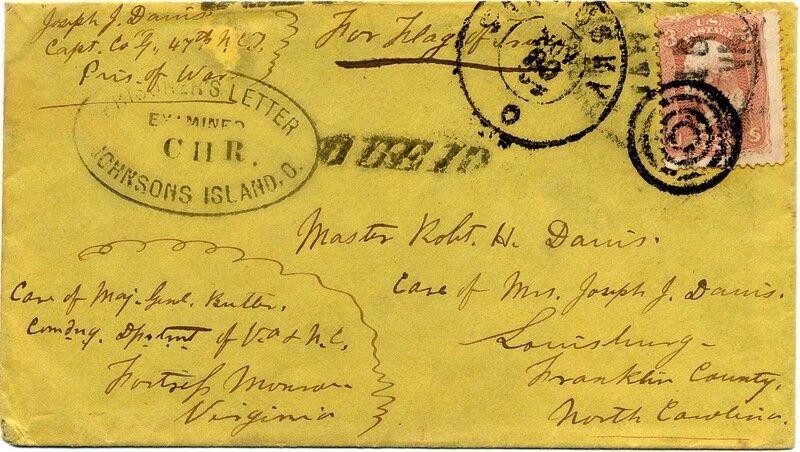 From September 1861 until late January 1862, most southbound mail was directed to Fortress Monroe where it was exchanged under flag of truce with Confederate officials at Norfolk, and letters were then placed in the Confederate mails at Norfolk. THIS SCARCE ROUTE WAS ONLY IN PLACE FOR FIVE MONTHS. Union Secretary of War Simon Cameron called a halt to all civilian flag of truce exchanges in January 1862 and was affirmed by Edwin Stanton in May 1863. Not all flag of truce mail bears a censor marking. $900. CIVILIAN FLAG-OF-TRUCE: NORFOLK / VA. // FEB / 22 / 1862, blue cds with matching [PAID] 5 handstamp (CSA type C) on civilian flag-of-truce cover to Miss Harriott Middleton, Charleston, So.Ca Pencil "Exd. S.G." Extremely Fine, CSA Catalog type CIV01 (CV $750). The Middleton correspondence is well-known and this was likely from Harriott’s sister Anne M. Hunter of New York. 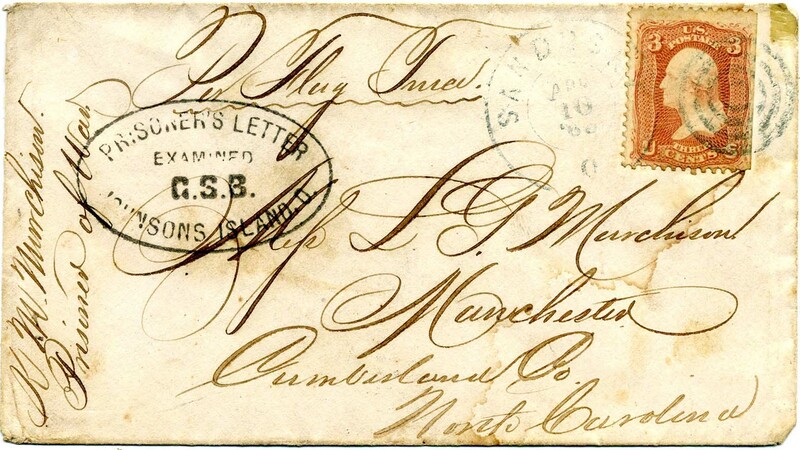 From September 1861 until late January 1862, most southbound mail was directed to Fortress Monroe where it was exchanged under flag of truce with Confederate officials at Norfolk, and letters were then placed in the Confederate mails at Norfolk. Union Secretary of War Simon Cameron called a halt to all civilian flag of truce exchanges in January 1862 and was affirmed by Edwin Stanton in May 1863, but In spite of the ban, some civilian flag of truce mail was exchanged throughout the war at the discretion of commanders at various flag of truce points. Letter was addressed to 44 South Bay in downtown Charleston, quite likely indicating delivery by the Penny Post. Norfolk remained in Confederate hands until May 10, 1862. $900. CIVILIAN FLAG-OF-TRUCE: "Via Flag of Truce Norfolk", manuscript endorsement on cover to Mrs. [Caroline Petigru] Carson, 6 East 120th Street, New York; photocopy of the original letter (in SC Historical Society) written Feb. 20th 1862 by her son James Petigru Carson at Willington S.C. and sent privately to Charleston where bold Charleston / S.C. // Feb / 24 / 186 cds struck and PAID 5 circular handstamp (CSA type E) struck to pay Confederate postage with US 65, 3¢ rose placed over it and tied by Old Point Comfort / Va. // Mar / 14 dcds; missing bottom flap and slightly reduced, Very Fine. Interesting letter saying he is staying in Willington for the moment trying not to offend either party so after the war he will be at liberty to go to either place. 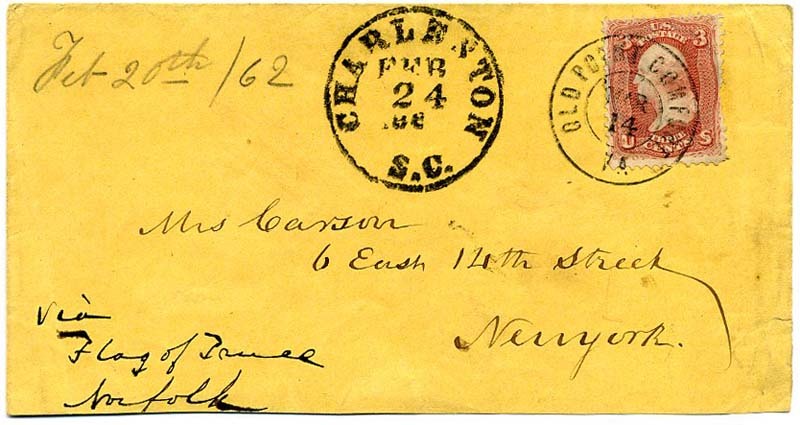 James Petigru Carson was an inventor, engineer and mineralogist of note known as the “Union Man of South Carolina.“ POSTAGE OF BOTH SIDES. If this had censor markings, it would catalog $4,000. $800. CIVILIAN FLAG OF TRUCE: CSA 12c, 10¢ greenish blue (4 margins) tied RICHMOND / Va. // SEP / 25 / 1863 cds on neat blue lined commercially made ladies cover to “Mrs. 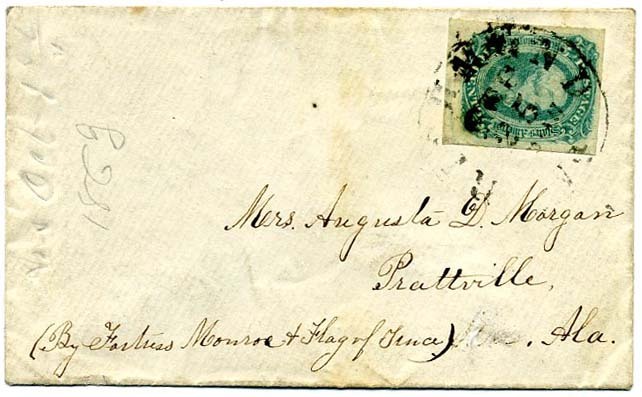 Augusta D. Morgan, Prattville, Ala (By Fortress Monroe & Flag of Truce)” with pencil docketing as received Oct 1, 1863. Mail exchanged in the East was delivered at Aiken’s Landing on the James River at Norfolk and later at City Point, The Flag of Truce boat New York was used for this purpose and plied from Union occupied Fortress Monroe to the exchange ground. $350. 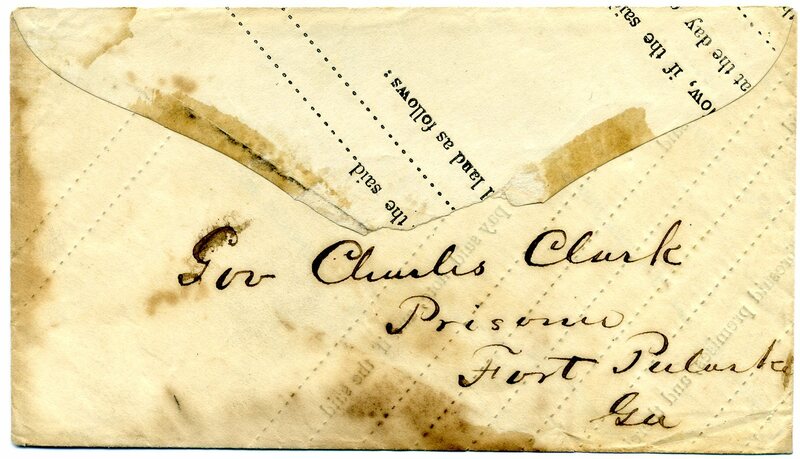 CAMP CHASE, COLUMBUS, OHIO: US 63, 1¢ blue vertical strip of three tied by blue grid cancels and light strike of WHEELING / [WEST] Va. cds on inbound prisoner cover to Wm. T. Goshorn, Care Capt. D.T. Tiffany Prison PM (Postmaster), Prison No. 3, No. 37, Camp Chase, Columbus, Ohio", manuscript examiner's marking "Gray Ex", 1862 receipt docketing, slightly reduced at right into bottom stamp, Very Fine, quite scarce with the 1¢ stamps. Goshorn was a political prison (Confederate sympathizer) from Wheeling [West] Va. He was the brother-in-law of U.S. Brig-Genl. Benjamin Kelley. Ex Losekamp and Bailor. $950. 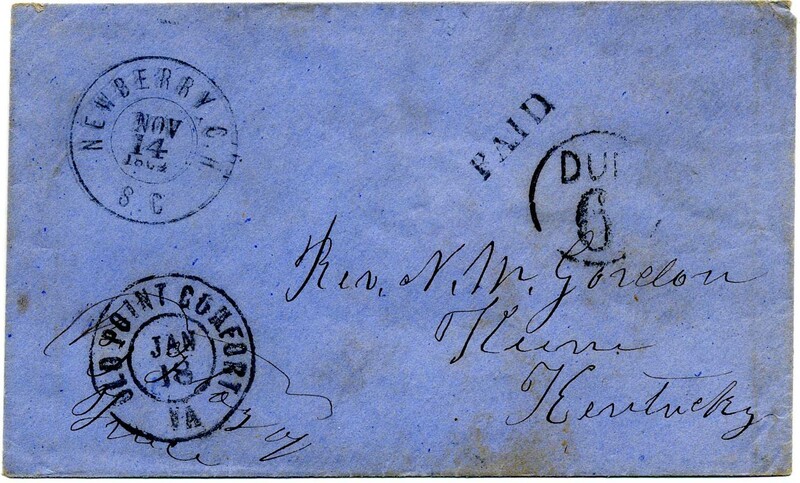 ROCK ISLAND BARRACKS, ILL: US 63, 73, 1¢ blue, 2¢ black tied by KEENE / KY // APR / 1 cds on prisoner's cover from Rock Island Prison to Miss Eliz C. Gordon, Keene Ky. and FORWARDED to Lexington Ky; stamps pay forwarding postage, light strike of blue R.I. Barrack, Prisoner's Letter, Examined oval handstamp, Rock Island dcds and target at right, originating postage removed or fell off, non-contemporary "1865" at center, some edge flaws and overall wear, Scarce forwarded prisoner's cover. $950. POINT LOOKOUT, MARYLAND (CAMP HOFFMAN): US 3¢ rose #65 (stamp is a replacement) on POW cover from Point Lookout to Mrs. James C. Carter, Hamptonville, N Carolina with endorsement of “G. 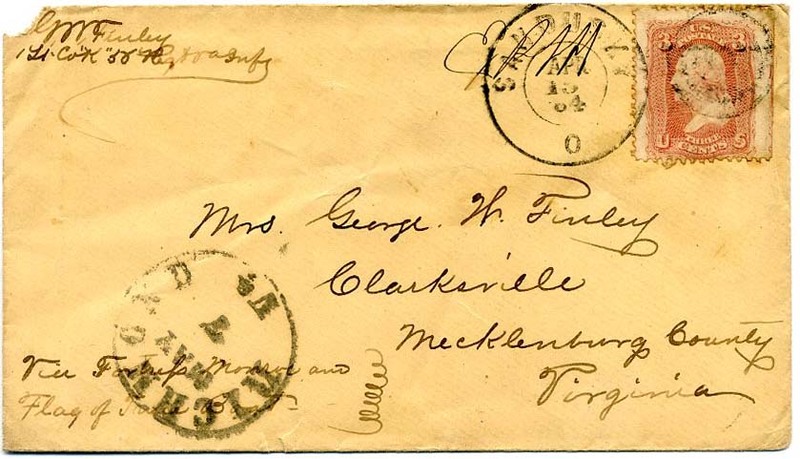 A. Carter Co. B 3rd Division [North Carolina]” with ms. directive “For Flag of Truce.” Point Lookout, Maryland, and Richmond, Virginia, postmarks with DUE 10 Confederate postage due and PRISONER’S EXAMINED octagonal marking (CSA Catalog PWH-17, type B). Original letter headed Point Lookout February 9th, 1865 from prisoner Green A. Carter to his mother saying “my health is somewhat delicate.” A quick search did not find his records; most research needed. CCV $800. $250. 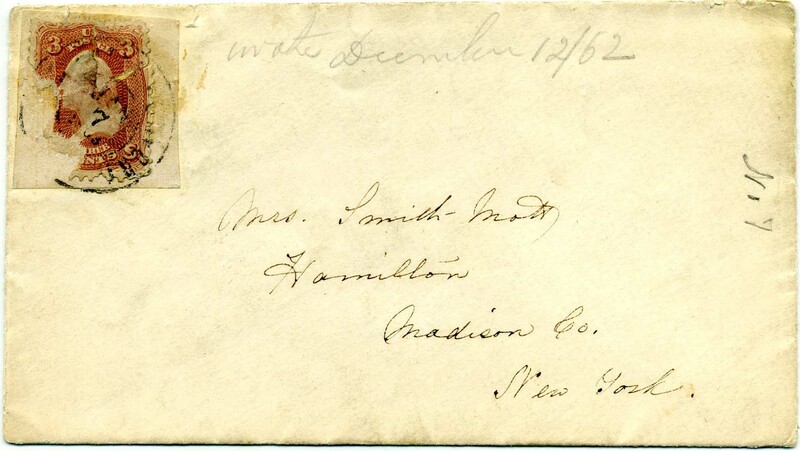 CAMP CHASE, COLUMBUS, OHIO: US 3¢ Nesbitt entire tied COLUMBUS / O // OCT / 11 with Camp Chase Examined handstamp, CSA Catalog PWH-245 type C, addressed to Doctor Michael Effinger, Lancaster, Ohio. Dr. Effinger was a respected physician in Lancaster and a good friend of General Wm. T. Sherman in boyhood and as adults. Clean cover with ¾” tear at left edge. $150. 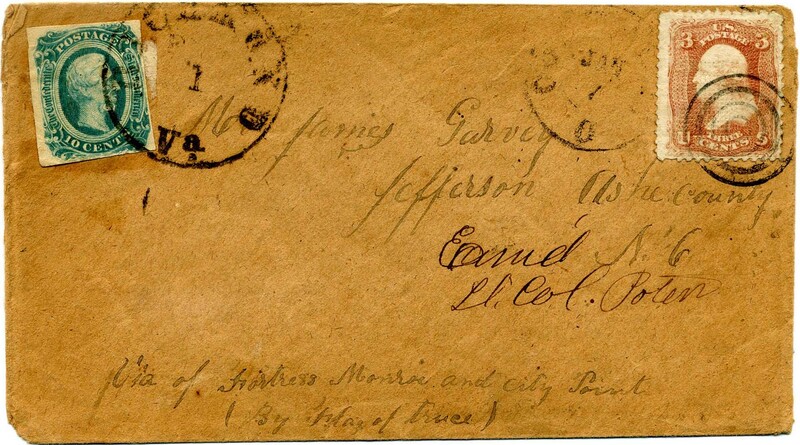 JOHNSON’S ISLAND, SANDUSKY, OHIO: US 3¢ rose #65 tied with pen cancel, manuscript cancel of “Jacksonville [MO] Nov 11” on incoming cover to “Lieut. W. G. Woods, prisoner of war, Johnson’s Island, Sandusky, Ohio, Block 11” and ms. directive “In care of Col. Pierson.” TOC Examined oval on back flaps, CSA Catalog PWH-25, type A, long original enclosure headed Randolph Cty Mo Nov 11th 1864 to writer’s Cousin Willie from Cousin Fannie saying, in part, “your letters were detained on account of the mails being stoped for a few days on the Northern Missouri railroad” but that clothes and shoes he requested are packed and on the way to him. $150. William G. Woods was mustered into Co. D, NC 13th Infantry, Scales’ Brigade, Pender’s Division, 3rd Corps, Army of Northern Virginia. Much more information on linked page. FORT PULASKI, near SAVANNAH, GEORGIA: Handcarried adversity cover fashioned from a land deed and addressed to “Gov. Charles Clark, Prisoner, Fort Pulaski, Ga (Governor of Mississippi). Clark, a wounded veteran of Shiloh, was a Confederate Brigadier General and a Major General in the State Militia. He was reelected governor in 1863 while in the service. He was imprisoned for two months after the surrender on June 13, 1865, for threatening insurrection against the United States. A fascinating story that will be told in one of my columns. RARE USE FROM A RARE SOUTHERN PRISON AFTER THE WAR WAS ENDED. None like this listed by Harrison. Plantation Collection. $1,250. 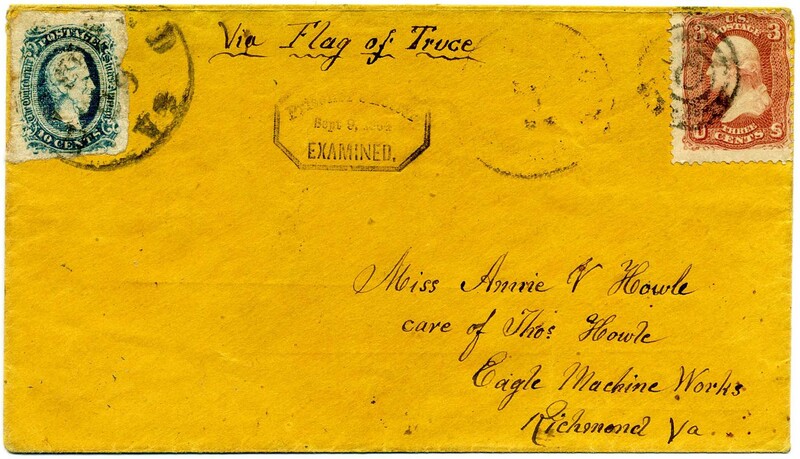 CIVILIAN FLAG OF TRUCE: CSA 11, 10¢ blue (4 margins, light pre-use creases) tied RICHMOND / VA // MAY / 13 cds on cover to Miss Anna R. Tuthill, Columbia, South Carolina, with manuscript directive at top left, “For Flag of Truce.” From Anna’s sister, Emma J. Tuthill, in the North (East Otto, New York). Envelope is pristine and the gummed flap (commercially made cover) has never been sealed, open for examination, this being the inner cover. Plantation Collection. $300. DANVILLE, VIRGINIA: US 65, 3¢ rose (pre-use corner crease at UR) tied cork grid with Old Point Comfort, Va, Jan 18  double circle cancel on unsealed inner envelope from prisoner Doctor Tarbell to his fiancé, Mary L. Conant, Peru Ville, N.Y., with manuscript directive at lower left, “Per Flag of Truce Via Richmond Va” with manuscript examined markings “Ex A.M.B.” – identified by Harrison as a Danville examined marking on page 71. Postmark ink fingerprint smudges add some additional interest at center with great ridge detail for the forensic fans. All Southern prison uses are rarer than their Northern counterparts. Plantation Collection. $1,100. Doctor Tarbell (1838-1895 – his name was Doctor, not his profession) served inn the U.S. Volunteers Commissary Department. Much more information on linked page. 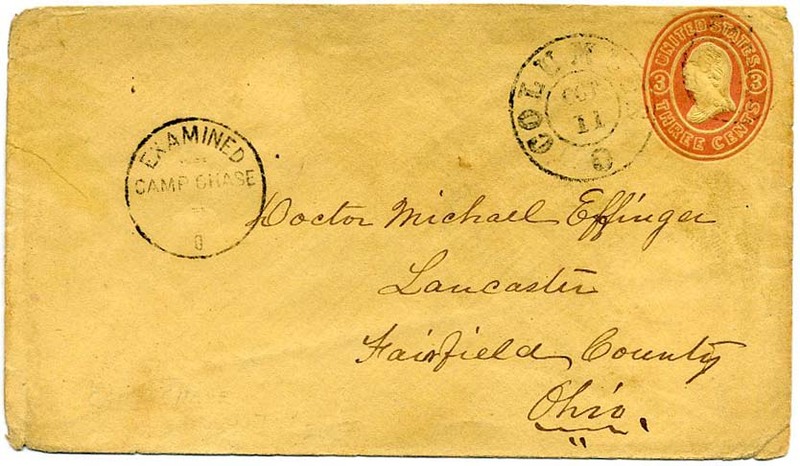 JOHNSON’S ISLAND, SANDUSKY, OHIO: US 65, 3¢ rose tied Sandusky duplex on POW cover to Miss L. G. Murchison, Manchester, NC, with manuscript directive “Per Flag Truce” and soldier endorsement “K. M. Murchison, Prisoner of War” in extremely flowery penmanship; bold G.S.B. oval censor examined marking from Johnson’s Island. Plantation Collection. Pink lined commercially made cover with no evidence of Confederate postage paid; mostly unsealed back flap (stuck down on one side). $550. Kenneth McKenzie Murchison was an officer in Company E, NC 8th Infantry, later in Company F, NC 15th Infantry and Company C, NC 54th Infantry. Much more information on linked page. CAMP CHASE, COLUMBUS, OHIO: US 65, 3¢ rose tied “prison bars” grid and used with Columbus O / Jun / 20  circle datestamp on cover to Mrs. C. E. Evans, Upper Falls, MD, with manuscript censor marking “Exmd, E. L. Webber, Mjr Comdg Post” which was used Jan 30-Oct 20, 1863, according to Harrison, page 181. Plantation Collection. $300. 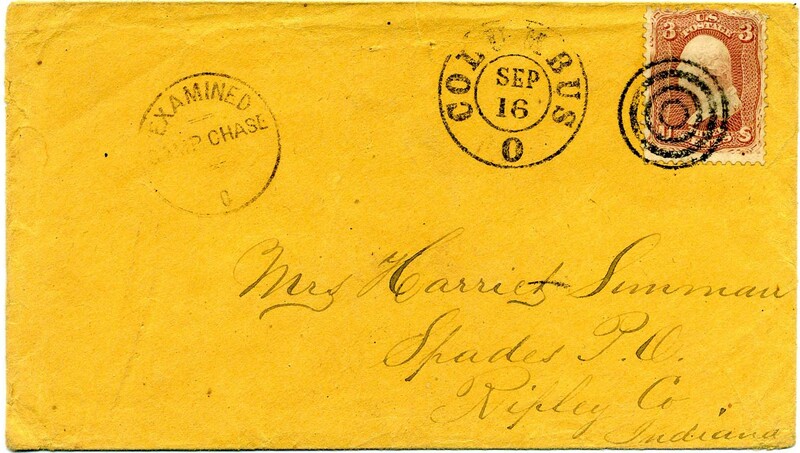 CAMP CHASE, COLUMBUS, OHIO: US 65, 3¢ rose tied COLUMBUS / O // SEP / 16 duplex on cover to Mrs. Harriet Summan, Spades PO, Ripley, Co, Indiana. Prison censor marking (CSA Catalog PWH-24, type C). Plantation Collection. $300. H. Summan enlisted as a private in Co. Co, 3rd Battalion Tennessee Infantry on 3-12-62. He is the only person by the name of Summan in the Confederate army. JOHNSON’S ISLAND, SANDUSKY, OHIO: US 65, 3¢ rose tied cork cancel with OLD POINT COMFORT / VA // FEB / 21  dcds on clean homemade cover to “Capt. John S. Reid (Prisoner of War) Johnson’s Island, Sandusky, Ohio.” Two different sets of manuscript censor markings: “Exd E.A.T.” and “Ex J.C.B.” Plantation Collection. $300. Capt. John S. Reid served in Co. B, 3rd Georgia Infantry. More information on linked page. POINT LOOKOUT, MARYLAND (CAMP HOFFMAN): US 65, 3¢ rose used with Point Lookout, Md, May 23 ’64 cds on pristine cover to B. S. Hedrick, Washington City, D.C. Transcript of original letter which this cover contained, but no longer with the cover. It was written by L. Lloyd, Prisoner of War, from Chapel Hill and asks for “a dollar as an act of kindness.” No examined markings present but clearly a POW cover; well-known correspondence. On verso is the docket, “Answd with one dollar, May 25, 64.” $100. Benjamin Sherwood Hedrick was dismissed from the University of North Carolina in for his Republican and anti-slavery opinions. In 1861, he was appointed to a position in the U.S. Patent Office, He corresponded heavily with Confederate prisoners in Union prisons, widely known for supporting them with small sums of money upon request. Much more information on linked page. Lucius J. Lloyd served in Co. G, NC 28th Infantry, Branch’s Brigade, A.P. Hill’s Division, Army Northern Virginia.Much more information on linked page. POINT LOOKOUT, MARYLAND (CAMP HOFFMAN): US 65, 3¢ rose used with Point Lookout, Md, Dec 7 cds on small clean cover to Benjamin Hedrick, Washington Cty, M.D. 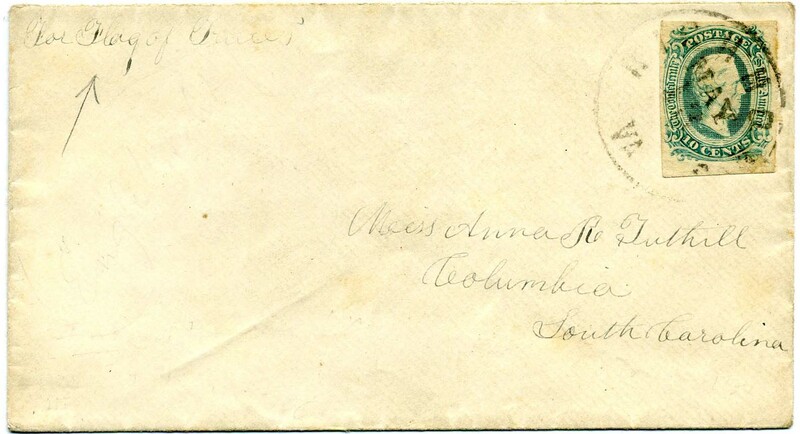 No examined markings, but clearly a POW cover; well-known correspondence from North Carolina Southern abolitionist living in the North during the war. $70. JOHNSON’S ISLAND, SANDUSKY, OHIO: US 65, 3¢ rose used with Sandusky, O, Sep 22, ’64 duplex cancel on cover to “Prof. B. S. Hedrick, Washington City, D.C, Patent Office.” Manuscript examined censor markings at top Flap faults, bit of edge wear and light staining. 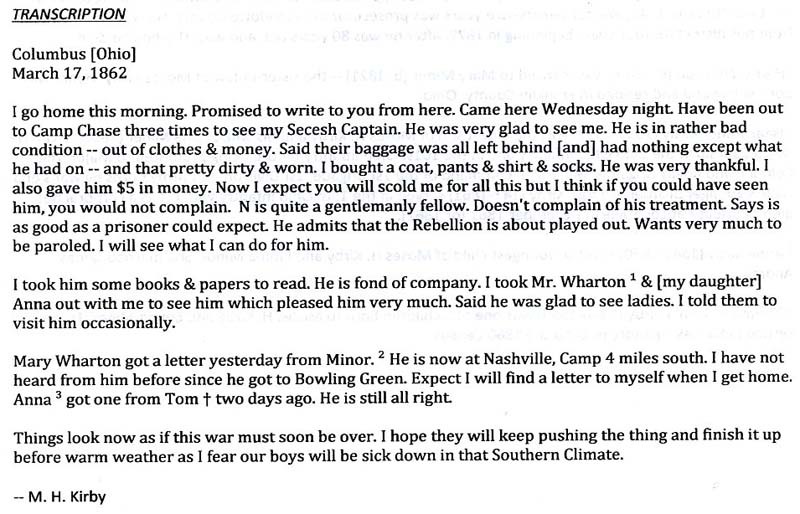 Well-known correspondence to North Carolina Southern abolitionist living in the North during the war. $180. 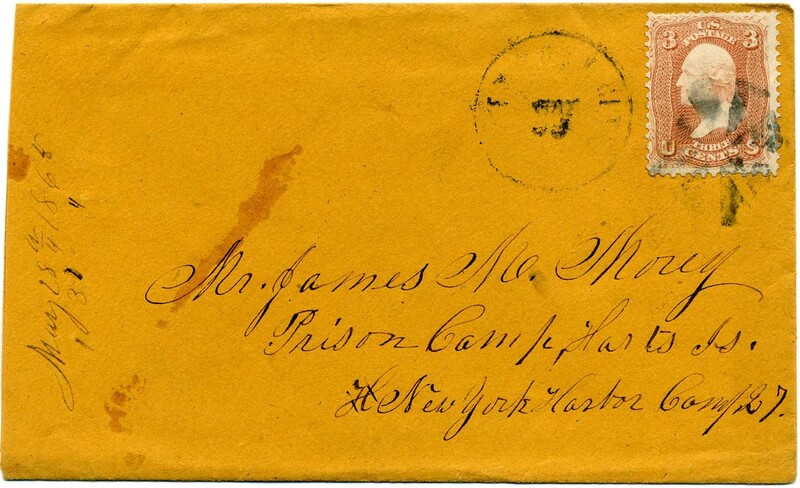 HARTS ISLAND PRISON CAMP, NEW YORK HARBOR N.Y.: US 65, 3¢ rose tied light JERSEY CITY / NJ cds and cork, addressed to "James M. Morey, Prison Camp, Harts Is[land], New York Harbor, Camp 27,” May 18, 1865 docketing at left; slightly reduced at left, ONLY 22 COVERS ARE REPORTED FROM THIS PRISON--all are from the Morey correspondence. ORIGINAL LETTER from Morey’s mother, who had moved to New Jersey at the home of a relative to help facilitate his release. She says she has just arrived and has brought with her the papers necessary to secure his freedom, to keep a cheerful heart for the war is over and he is alive and well and “almost home.” She says, “should have visited you in camp had you not discouraged it.” Hart's Island, in Long Island Sound, was the last prison established by the Union to house CSA prisoners and was IN OPERATION FOR ONLY ABOUT FOUR MONTHS at the end of the war. Another Morey Hart’s Island lot sold in a recent Rumsey sale for $1,667. $900. James M. Morey (1844-1923) enlisted in Co. D. 32nd Tennessee Infantry 10-15-62 and attained the rank of Corporal. He was captured at Orangeburg, S.C. February 15, 1865, and sent to Harts Island Prison April 10/released June 14. CIVILIAN FLAG OF TRUCE: NEWBERRY C.H. 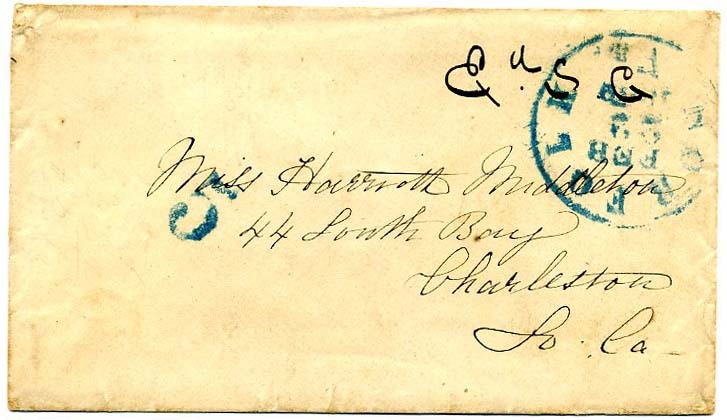 / S.C. // NOV / 14 /1864 double circle datestamp on small clean blue commercially made cover with PAID from Newberry showing that the Confederate postage was paid. Manuscript “By Flag of Truce” at lower left and addressed to Rev. N. M. Gordon, Keene, Kentucky. Union postage was noted with DUE 6 (3¢ penalty for not prepaying the postage because this is a civilian, not military cover). This is the only Flag of Truce cover from the Newberry District per Giana Wayman and it broke several rules, although there were not infrequent exceptions. There is no evidence of censorship; evidently, they let this one go through. Had there been a CSA stamp on it, it likely would have gone to the Dead Letter Office. Starting in mid-February 1862, civilian flag-of-truce mail sent North was diverted to the Dead Letter Office, per U.S. General Order No. 7. 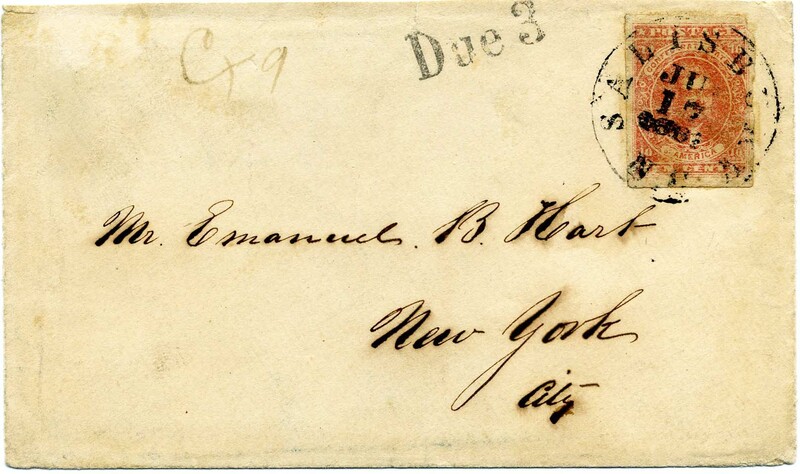 This order followed an announcement in the January 1862 U.S. Mail & Post Office Assistant that stated, "The facilities afforded by sending letters to the rebel states under a flag-of-truce are not intended, and cannot be permitted, to cover general correspondence." By the end of February, the CSA mail system stopped forwarding almost all such letters. 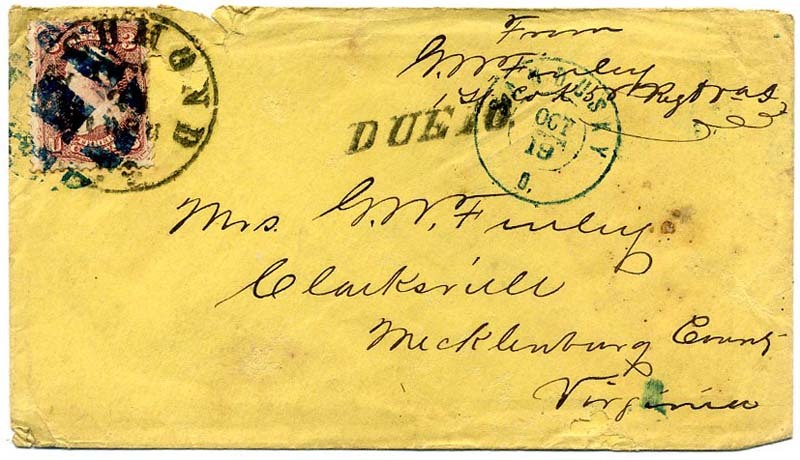 The cover was sent unsealed because civilian mail was subject to examination just like prisoner mail. It did not use the mandated two envelope method; we don’t know if the letter was properly kept to one page per regulations. There are other covers from this correspondence (lot 4114, Siegel sale 981, Walske collection) that did end up in the Dead Letter Office from Rev. N. M. Gordon but from Keene, Ky, going South. An exceptionally nice and unusual use. Article about this cover will be in my 2Q 2017 column in La Posta. Ex Wayman. $1,500. CIVILIAN FLAG OF TRUCE AND TRIME COIN PASTE-UP: Mott-Bostick correspondence--TWO MATCHING COVERS from the Mott-Bostick correspondence addressed to Mrs. Smith-Mott, Hamilton N.Y., both franked with 3¢ Rose #65 tied by Old Point Comfort / Va. 1863 double-circle datestamps affixed over the spot where PASTED "TRIME" (3¢) SILVER COINS originated and were covered with a square of paper (both stamps defective from removal, coins no longer present but in one case the outline of the coin impression remains). SCARCE PAIR OF CIVILIAN FLAG-OF-TRUCE COVERS EVIDENCING COIN PASTE-UPS TO PAY POSTAGE AND RARE CONTENT ADD-ON BY AGENT OF EXCHANGE MULFORD. Ex Walske and Fisher (on Fisher exhibit pages) $1,200. Much more detailed information on linked page. 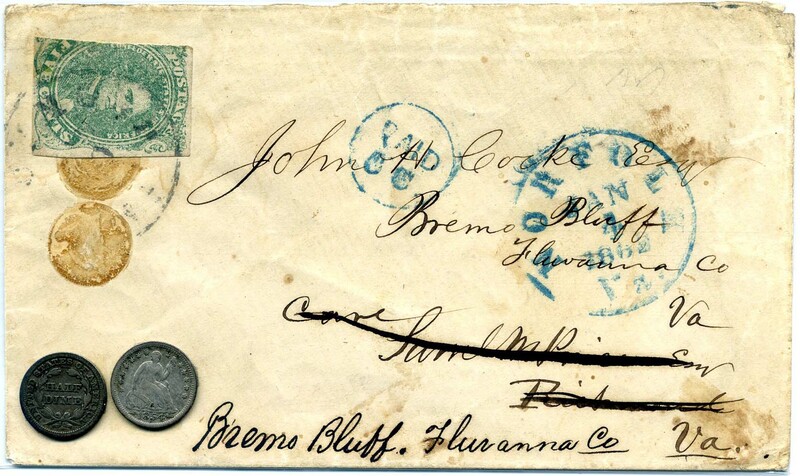 CAMP CHASE, COLUMBUS, OHIO: US 3¢ rose (grilled/stamp replaced) with COLUMBUS / O Jan 7 duplex, to James Garvey, Jefferson, Ashe County, N.C., Ms. “Via Fortress Monroe and City Point (By Flag of Truce)” from where it went to Richmond; CSA 12, 10¢ blue tied RICHMOND / Va./ FEB / 1  cds. 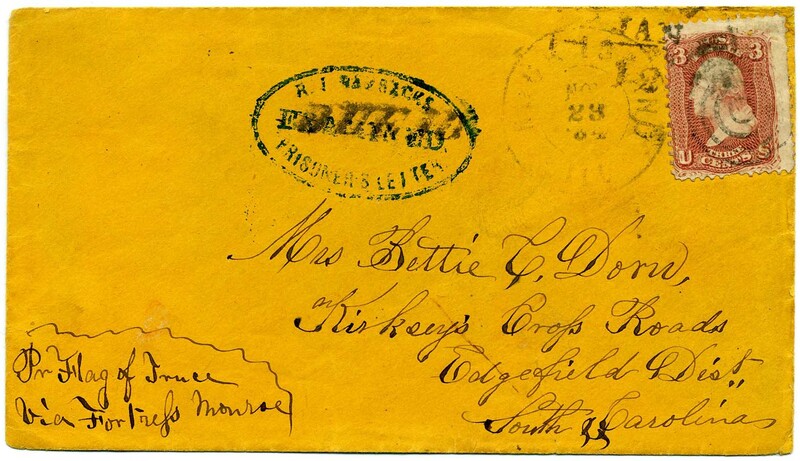 Outgoing cover from Camp Chase and examined “Exmd Lt. Col. Poten” who commanded the prison and examined the mail from October 1863 to May 1864. Ex Fisher. $650. 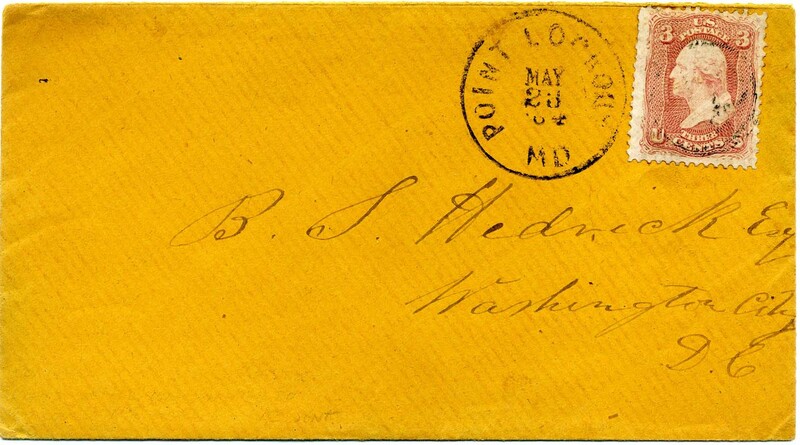 POINT LOOKOUT, MARYLAND (CAMP HOFFMAN): U.S. 3¢ rose #65 tied ONANCOCK, VA, dateless cds, RARE CIVIL WAR POSTMARK from the Eastern Shore, Delmarva Peninsula; on incoming cover front only, addressed to “Sergeant L. Warrington Wise, Prisoner of War, 4th Division, Pt. Lookout, Md., Care of Major Brach; magenta docketing indicating letter was from M.S. Bagwell, Onancock, Va., May 3, 1865. 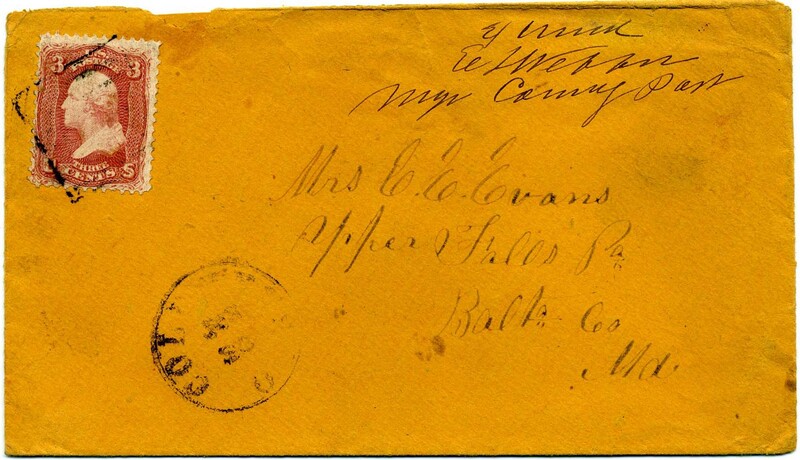 A scarce Delmarva Civil War postal connection. $300. Lewis Warrington Wise - Field & Staff, Virginia 46th Infantry, Gen. Henry A. Wise’s Brigade, Johnson’s Division, 4th Corps, Army of Northern Virginia. Much more information on linked page. JOHNSON’S ISLAND, SANDUSKY / OHIO: US 65, 3¢ rose tied target and RICHMOND / Va. JAN 16 CDS with matching DUE 10, also pencil ms “Due”, SANDUSKY / O. double circle and C.S.B. 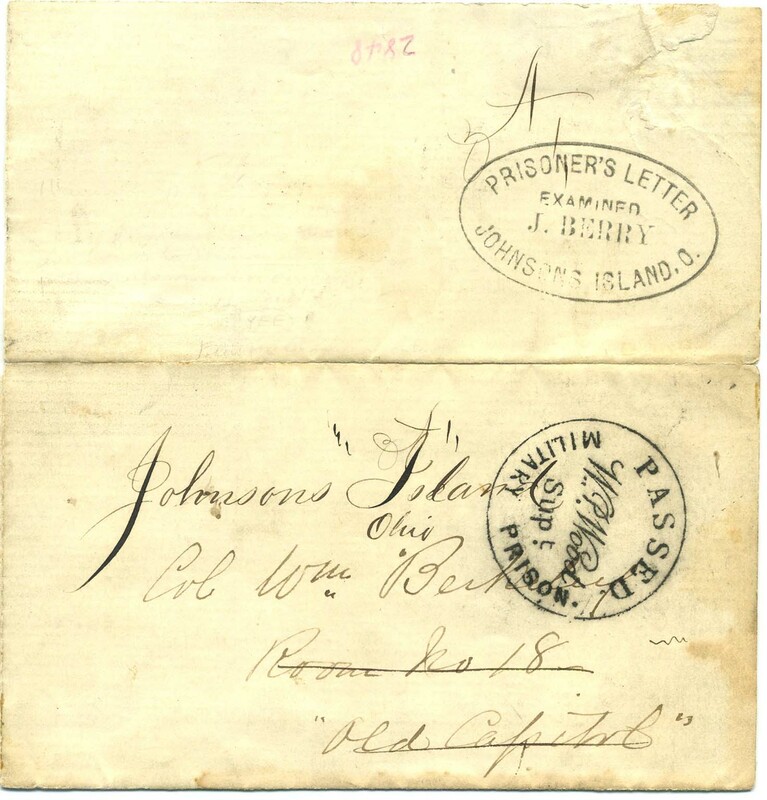 Prisoner’s Letter examined oval of Johnson’s Island on cover to “Mrs. A. R. Taylor, Columbia, So. Ca” and ms. routing “Per Flag of Truce.” Properly docketed by “J. Taylor, Lt. 7 S. C. C.” Stamp with replaced lower right corner restoration. 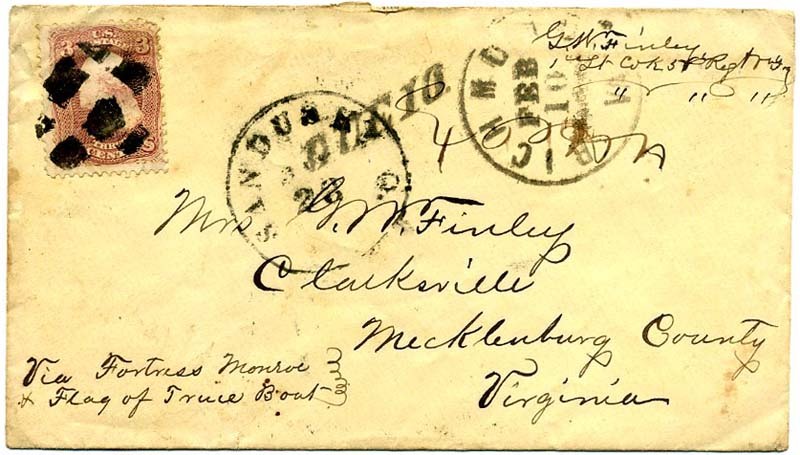 Great postal use from both sides on one cover (illegal, as the inner envelope was supposed to be discarded at the exchange point), Ex-Cantey. $350. Much more information on linked page about the South Carolina 7th Cavalry Regiment. JOHNSON’S ISLAND, SANDUSKY / OHIO: CSA 11, 10¢ blue tied RICHMOND / VA on cover to Joseph Daviers, Hamilton, Esq., Montgomery, Alabama routed “By flag of truce”. Unsealed inner envelope originally enclosed inside another envelope, per regulations. 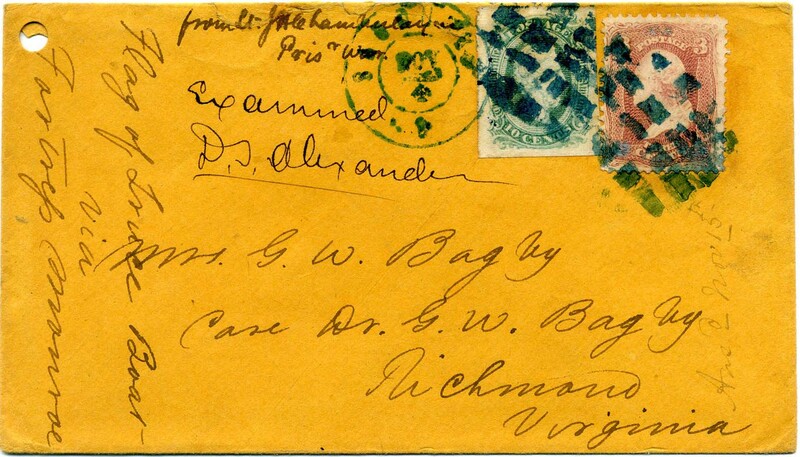 The outer envelope with US postage would have been discarded at the exchange point and then this one transmitted to enter the mails in Richmond for forwarding to Alabama. Military and regimental records included. This is a known correspondence which corresponds to other handwriting / covers of origin from Johnson’s Island. Ex Hedin. $450. Thomas H. Hamilton enlisted as a 2nd Lieut. in Co. K., 18th Tenn. Infantry. More information on linked page. SALISBURY PRISON, NC: CSA 12, 10¢ blue tied SALISBURY / N.C. cds on pristine POW cover from a civilian who was captured on board a mail boat from Norfolk and held hostage by Confederate forces; addressed to his wife in South Windham, Conn.; endorsed "A Prisoners letter by Flag of Truce, OLD POINT COMFORT / VA // JUN / 4  dcds and Due 3 handstamp. Envelope unsealed for censor and pencil "Exd" beneath Old Point Comfort datestamp; stamp slightly creased at top from overlapping edge of cover, still Very Fine. CHOICE AND RARE. $2,750. Charles Thompson was a civilian from Connecticut who was captured when "the mail boat out of occupied Norfolk fell into Confederate hands [and with two others] had been retained as hostages for the safety of Confederate citizens held in Union prisons." Much more information on linked page. 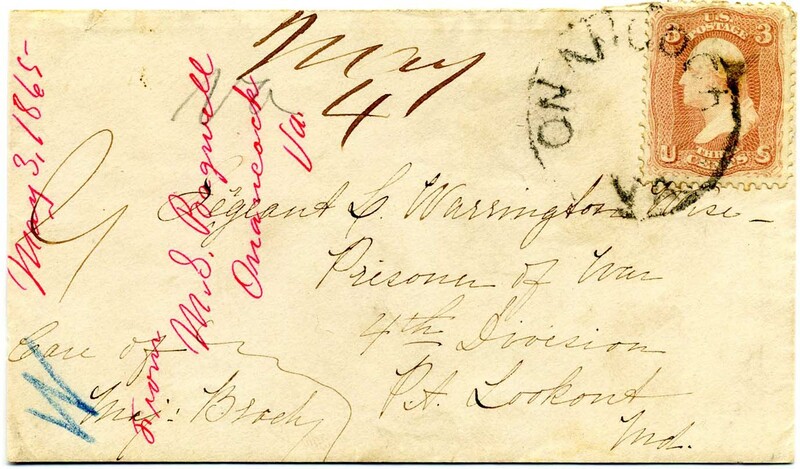 RICHLAND JAIL, COLUMBIA, SOUTH CAROLINA: outgoing prisoner of war cover to Eugene R. Payne, Tonawanda, Erie, Co[unty] N.Y., with "Old Point Comfort, Va." cds and Due 3 handstamp, with manuscript "Exam, R.D. Senn, Capt. 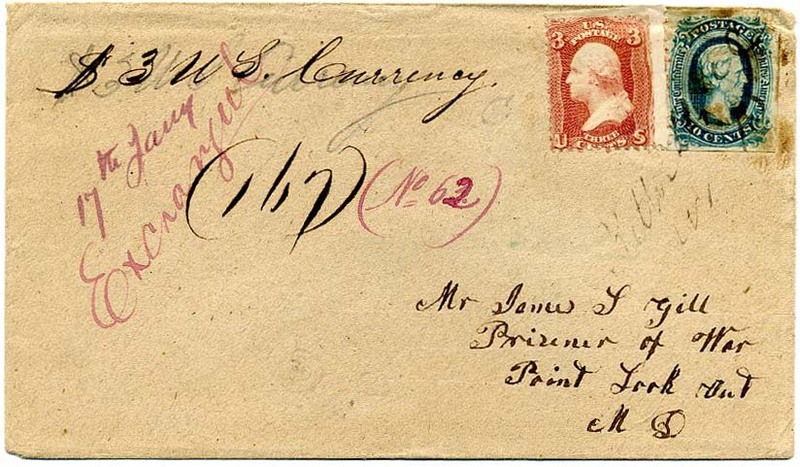 Guard" examiner at left and “Prisoner of War letter By Flag of Truce from Richmond Care Genl Winder at Richmond” at top; cover slightly reduced at the top, a rare use from Richland Jail, with ONLY 39 COVERS RECORDED IN HARRISON. Sent by Lewis S. Payne who was asserted as the “CIVIL WAR’S MOST FAMOUS SCOUT.” Article in the 3Q 2018 issue of Kelleher’s Stamp Collectors Quarterly. $2,500. Lewis S. Payne was one of the war’s most successful scouts. Full biographical information on linked page. 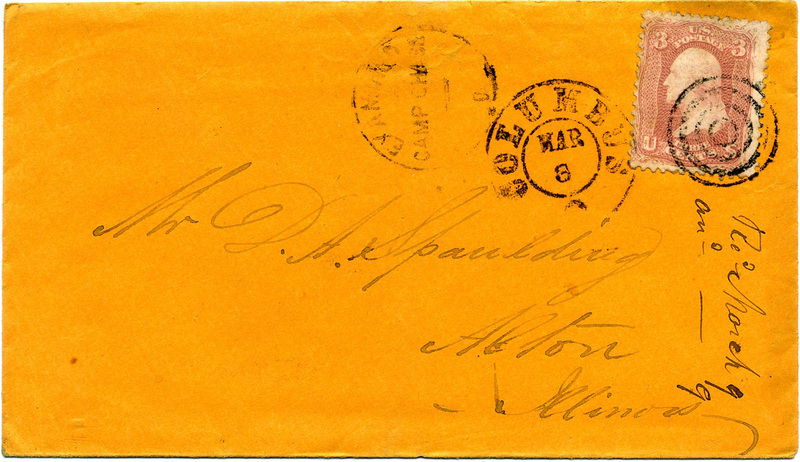 CAMP CHASE, COLUMBUS, OH: US 65, 3¢ rose tied COLUMBUS / O // MAR / 8 duplex with Camp Chase examined marking (CSA Catalog PWH-24 type C) on fresh cover to Mr. D. A. Spaulding, Alton, Illinois, with ORIGINAL LETTER headed U.S. Military Prison, Camp Chase, Ohio, March 1st, 1865, from Florida soldier Archibald (Archie) A. Livingston saying that he is among the last to reach Camp Chase and thus will be among the last to be exchanged. Indeed, he was prophetic as he was not sent South until June 12, 1865, well after the war was over. He says he suffers much from the cold and requests some articles of clothing; he dreads snowing and freezing weather. Subject of my column in 4Q 2018 La Posta. $400. Archibald A. Livingston served in Company G, Florida 3rd Infantry. Detailed biographical information on linked page. CIVILIAN FLAG OF TRUCE: SALISBURY, NC: CSA 5, 10¢ ROSE, full to large margins, small nick at top right just into design, tied SALISBURY / N.C.// JUL / 17 / 1861  circular datestamp with usual year-date error on civilian flag-of-truce cover from Salisbury N.C. to Emanuel B. Hart, New York City, with original letter from Myer Myers datelined "Salisbury N.C. 16th July 62", "Due 3" handstamp for U.S. postage, manuscript "Exd" examiner's mark, letter reads in part "I have been very much disappointed at my dear wife and children not having arrived on this as there has been several arrivals of Ladies by Flags of Truce in the last three weeks", very slight edge wear, lightened gum stains. EXCEPTIONALLY RARE NORTHBOUND CIVILIAN FLAG-OF-TRUCE COVER WITH THE 10¢ ROSE LITHOGRAPH. It is not clear how this flag-of-truce cover was handled. 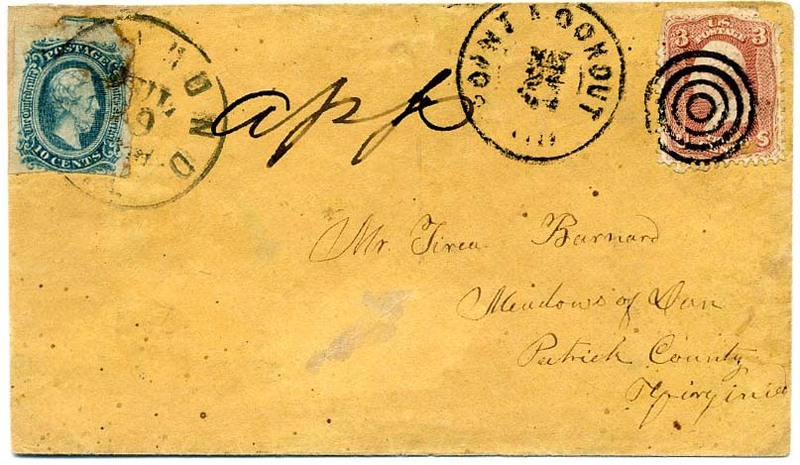 The regulations required the use of two envelopes for flag-of-truce mail. 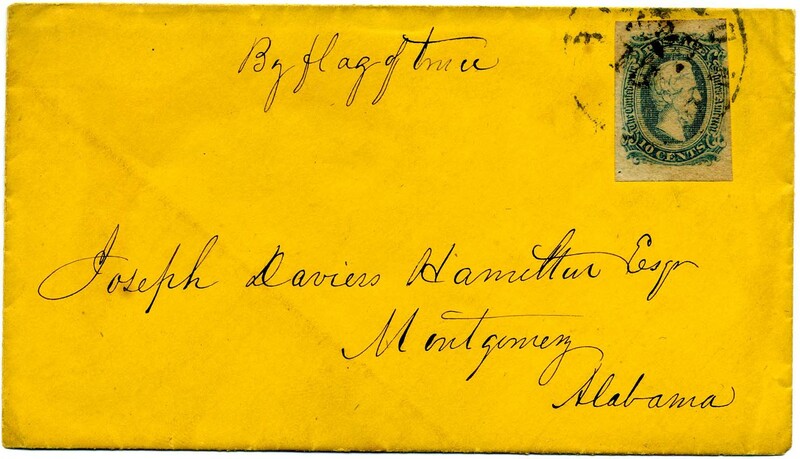 Ordinarily, on a South-to-North letter, the outer envelope would bear Confederate postage and an appropriately worded "Flag of Truce" address. 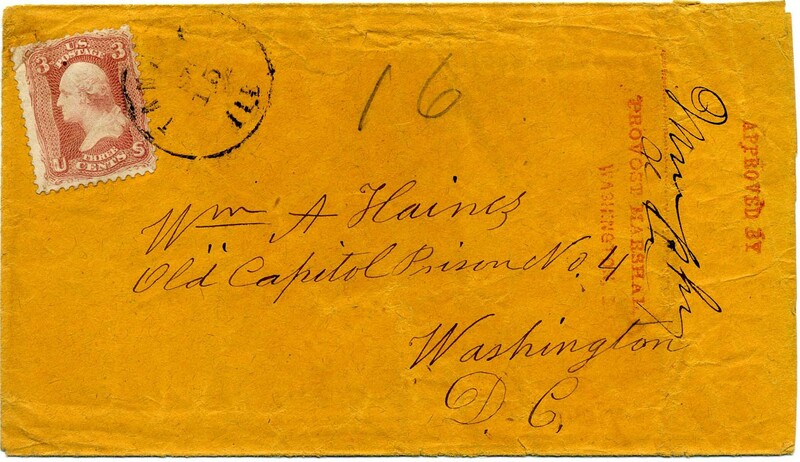 At the exchange point, the inner envelope bearing U.S. postage would be removed and put into the Federal mails. 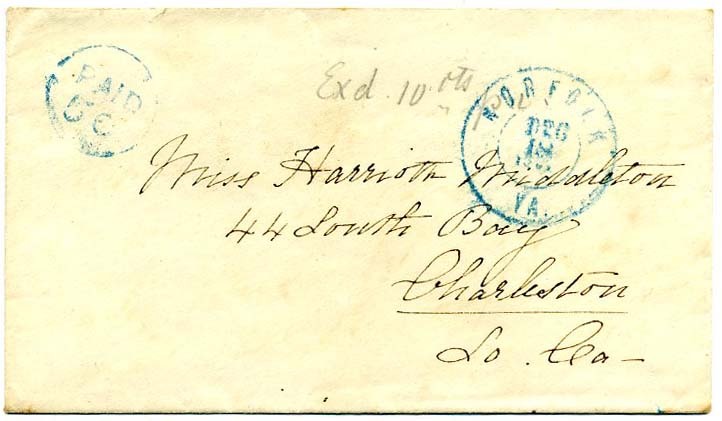 In this instance, it appears that the envelope bearing Confederate postage (the 10c Rose) was examined by the Confederate censor (manuscript "Exd") and placed into the mails, receiving a Federal "Due 3" handstamp. 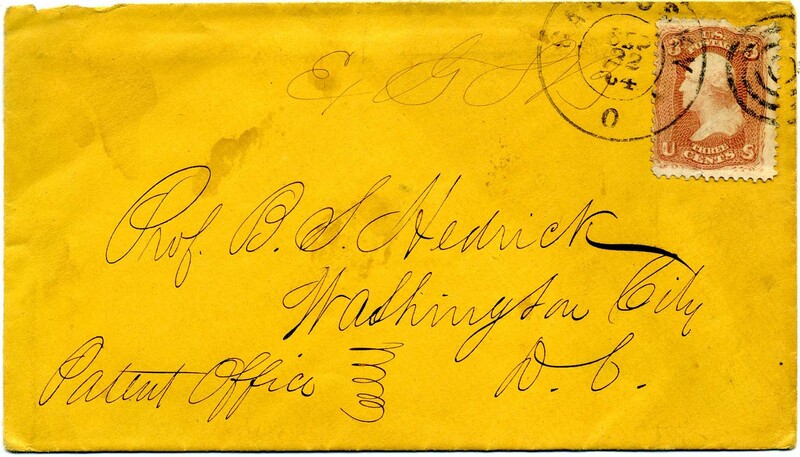 While the regulations were often breached by placing Confederate and U.S. stamps on one envelope, this cover -- without any Federal postmark other than the "Due 3" -- is enigmatic and obviously extremely rare, if not unique. Ex Murphy, Walske and Kilbourne. Illustrated in Antrim book on p. 195. SCV $5,500 for CSA 5 on POW cover. $4,000. CIVILIAN FLAG OF TRUCE: CSA 1-2, 5¢ green (corner replaced at LL), tied by RICHMOND / Va. cds on North-to-South civilian inner flag-of-truce cover to John H. Cocke, Esq., Bremo Bluff, Fluvanna Co[unty] Va Care Saml M P--, Richmond, Va., and FORWARDED on to Bremo Bluff Va. 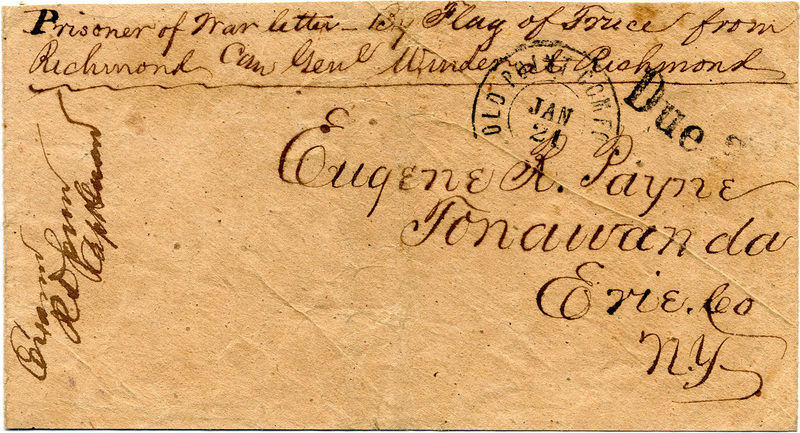 Exchanged via Old Point Comfort-Fortress Monroe, where the outer cover with U.S. postage was discarded. 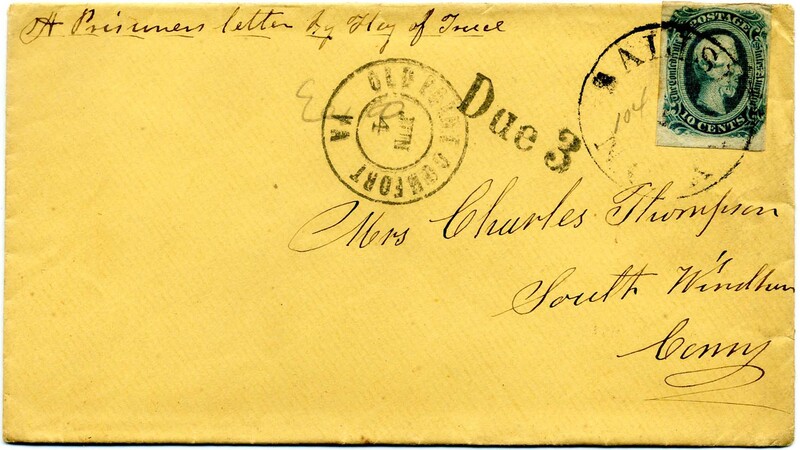 It entered the Confederate mails with blue NORFOLK / Va. JAN / 4 / 1862 cds and matching Paid 5c handstamp. Glue outlines of two Half Dimes, which were applied to pay the Confederate postage to Richmond and the forwarding postage to Bremo Bluff, specified in the address with a "care of" notation, replacement Half Dimes glued to the cover sleeve, some minor wear and staining. 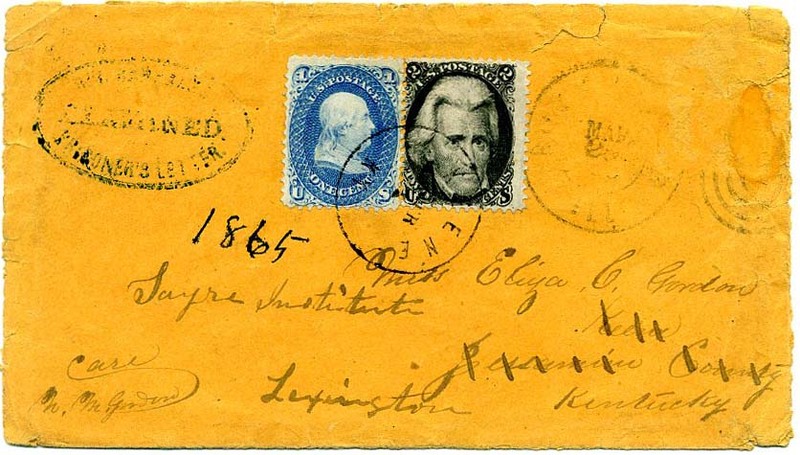 When this cover arrived in Norfolk, the bottom Half Dime was removed and the Paid 5c handstamp struck. When it was forwarded from Richmond, the top Half Dime was removed and the 5c stamp applied -- partly overlapping the glue from the coin. The sender anticipated this chain of events and planned accordingly. FASCINATING AND VERY RARE USE. Ex Shenfield, Weatherly, Gallagher and Kilbourne. $4,500. POINT LOOKOUT, MD: US 65, 3¢ rose tied target cancel, light strike Point Lookout Md. cds on prisoner-of-war cover to Miss Annie V. Howle, Care Thomas Howle, Eagle Machine Works, Richmond Va., mostly clear strike of PRISONER'S LETTER / SEPT, 9. 1864 / EXAMINED octagonal censor handstamp (type IIb); manuscript "Via Flag of Truce." MIXED FRANKING with CSA 11, 10¢ blue (horizontal crease) tied by RICHMOND / Va. // SEP / 29 cds, OVERPAID FOR CONFEDERATE POSTAGE BY 8¢. $1,250. JOHNSON'S ISLAND, SANDUSKY, OHIO: POW cover with 3c Rose (65), tied by blue segmented grid cancel, CSA 11c, 10¢ bluish green, large margins and similarly tied SANDUSKY / O. // NOV / 4 double-circle datestamp, to Mrs. G. W. Bagby Care Dr. G. W. Bagby, Richmond, Va.; endorsed "Flag of Truce Boat via Fortress Monroe" at left and "from Lt. J H Chamberlayne, prisnr War" at top, manuscript "Examined D. S. Alexander," small hole punch at upper left, few repaired edge tears at top, Very Fine, with 2016 PF certificate. $850. John Hampden Chamberlayne is an oft-quoted Confederate letter writer who was an artillerist during the Civil War. Served as an aide to Generals Reuben Lindsay Walker and A.P. Hill. Much more information on linked page. 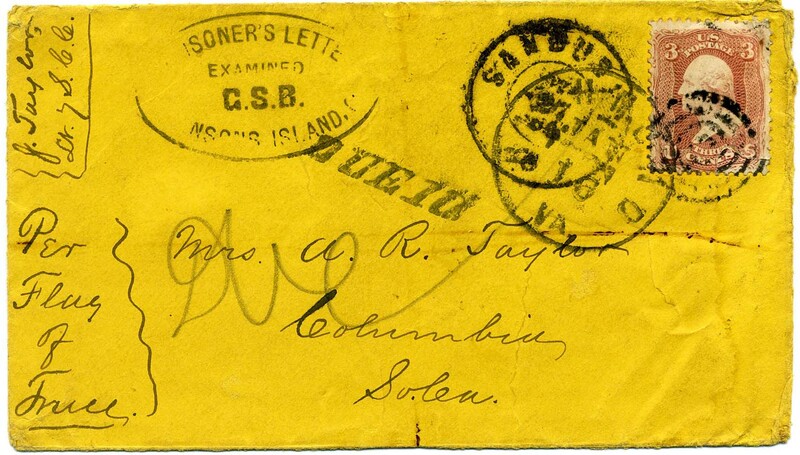 JOHNSON'S ISLAND, SANDUSKY, OHIO: clear strike of "Prisoner's Letter, Johnsons Island, O. Examined C.H.R." handstamp (Chauncy H. Roberts from Nov 1864 to May 1865) and manuscript "For Flag of Truce" on cover to Master Robert H. Davis, Care of Mrs. Joseph J. Davis, Louisburg, N.C., endorsed by "Joseph J. Davis, Capt. Co. G 47th NCT, Prisoner of War", US 65, 3¢ rose tied by bold target cancel, Sandusky / O. // Nov / 20 / '64 double-circle datestamp, RICHMOND / VA. // JAN / 13  cds with DUE 10 straightline, ms. directive “Care of Maj. Genl. Butler Comdng. Department of Va. & N.C., Fortress Monroe, Virginia,” Very Fine. $750. FORT MCHENRY, BALTIMORE MD. 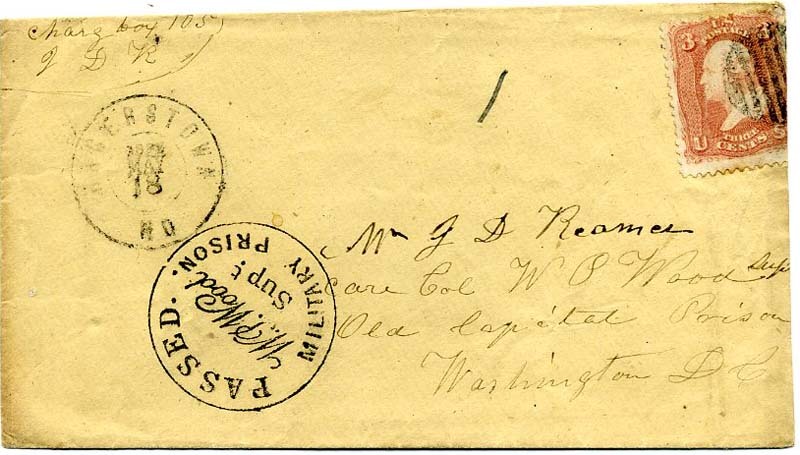 US 65, 3¢ rose with wide natural straightedge at left, tied by blue target cancel and matching BALTIMORE / MD // DEC / 8 / 1863 double-circle datestamp on POW cover to Mrs. B. F. Little, Little’s Mills, N.C., endorsed "Through Comdg. Officer at Fortress Monroe from Prisoner of War B. F. Little Capt. Co. E 52nd N.C. 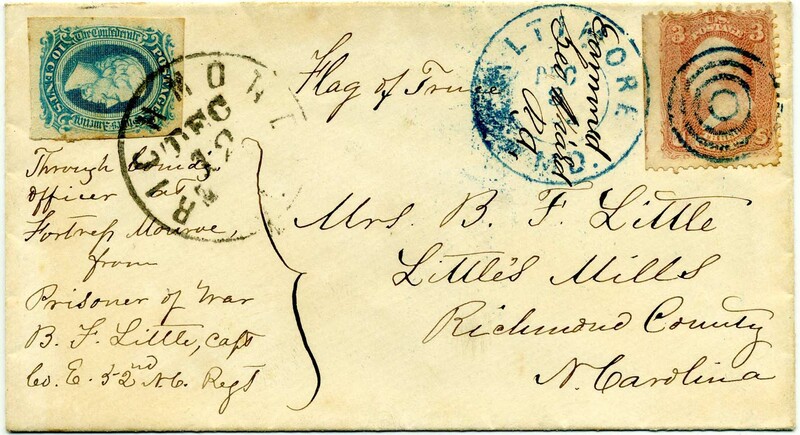 Regt.," also "Flag of Truce" at top, CSA postage paid by CSA 11, 10¢ blue with large margins, tied by RICHMOND / VA. // DEC / 12 cds, missing part of back flap, fresh and Very Fine mixed-franking from Ft. McHenry. well known correspondence, ex Kilbourne. $1,900. Benjamin Franklin Little served with the 52nd North Carolina Infantry Regiment and is well known to POW mail collector. He fought at Gettysburg, where he was wounded and his arm was amputated. Much more information on linked page. 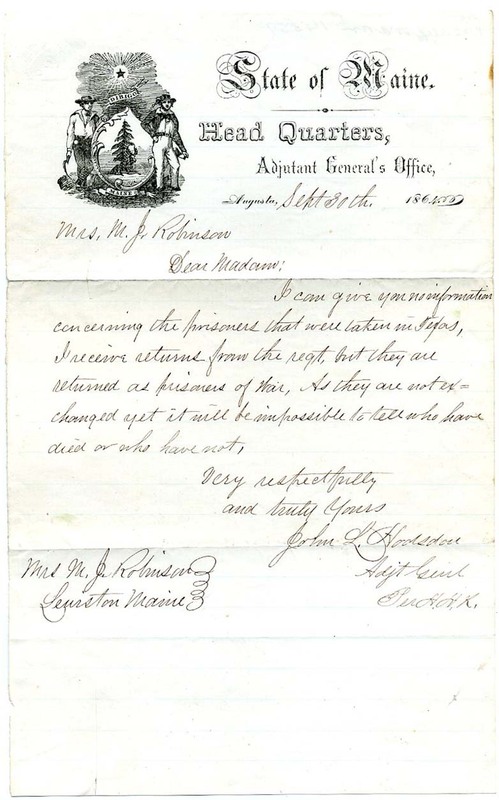 OLD CAPITOL PRISON (WASHINGTON, DC) and JOHNSON’S ISLAND, OHIO: Incoming prisoner of war letter from Baltimore to Old Capitol Prison, where FORWARDED to Johnson’s Island. 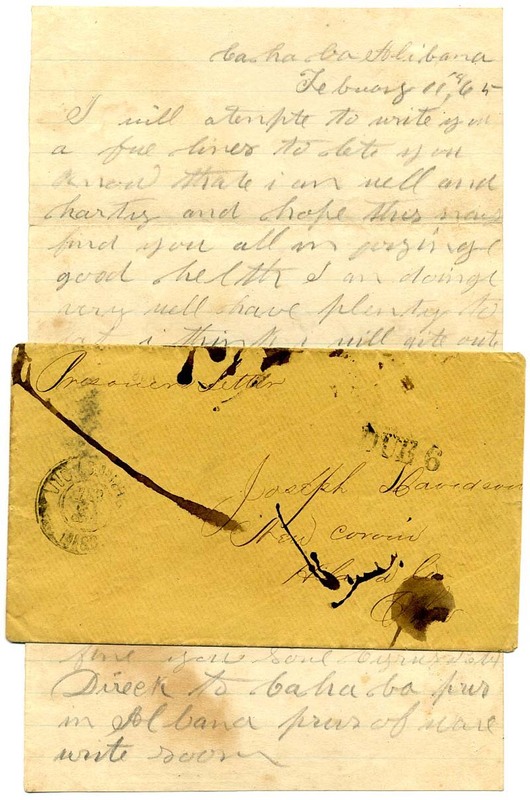 Folded letter from Ella MacKenzie of Baltimore to her “Cousin Billy” - Col. Wm. Berkeley, Room 18, “Old Capitol,” which has been crossed out and redirected to Johnson’s Island. Clear neat EXAMINED MARKINGS FROM BOTH PRISONS as well as manuscript examined markings, one on the first page of the letter in which Ella indicates she is not sure whether he has been returned to Johnson’s Island, as he anticipated. Clearly, he was. He signed the Oath of Allegiance on June 27, 1865. Nifty DUAL POW cover with stellar regimental connection to the “Old Bloody Eighth.” $1,200. William Noland Berkeley served in Field & Staff, Virginia 8th Infantry, Army of Northern Virginia in Eppa Hunton’s Brigade, Pickett’s Division, Longstreet’s Corps. He was wounded and captured at Gettysburg. Much more detailed information on the linked page. CAMP HOFFMAN (POINT LOOKOUT, MD): US 65, 3¢ rose tied Point Lookout March ? 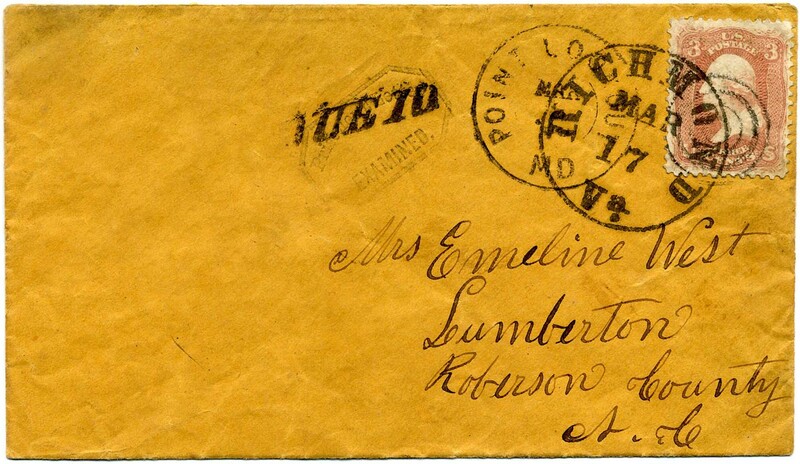 target cancel on POW cover to Mrs. Emeline West, Lumberton, Robeson County, N.C., with bold beautifully struck RICHMOND / Va. // MAR / 17  cds and soldier’s DUE 10 postal rating with light Type B censor marking (CSA catalog #PWH-17 used July 1864-March 1865, CCV $800). Back flaps with contemporary pencil docketing “One Day after Dated I Promised to Pay the back an forth Sum of 10 cents” - doubtless declaring that he promises to pay the postage due for the letter being sent. In pen, “this Day is nearly gone and nothing have I dun, this to my litle Emeline / E.W. Aprel 24 1865.” (original “inventive” spelling preserved) $800. Elias West served in Company A, NC 31st Infantry, Clingman’s Brigade, Hoke’s Division, 4th Corps, Army of Northern Virginia. More details on linked page. ROCK ISLAND BARRACKS, ILLINOISE: U.S. 65, 3¢ rose canceled target cancel with matching ROCK ISLAND / ILL // NOV 23 / ‘64 double-circle postmark and neat blue R.I. Barracks POW examined oval (CSA catalog type PWH-13a, type C, CCV $800). Straightline DUE 10 Confederate rate cancel with RICHMOND / VA. // JAN / 12  cds, which also cancels stamp. Pristine cover addressed to “Mrs. Bettie C. Dorn, Kirkseys Cross Roads, Edgefield Dist[rict], South Carolina” with ms. “Pr Flag of Truce via Fortress Monroe” at lower left. Unusually nice use of postage of both sides. 2008 CSA certificate calls out a pulled perf at bottom center of stamp. Ex-Katz $750.